A truly peculiar but unique branch of the Pecatonica system, this trip offers an obstacle course around strainers, some fun light rapids, and several stretches of gorgeous geology in a serene setting. Accesses are OK, but not great, and there’s a frustrating amount of deadfall in the first couple miles, including one nasty climb-over portage. But for the intrepid and incurably curious, this branch of the Pecatonica River is a rewarding novelty. Gauge note: This is a correlation gauge that is geographically close but still on a separate branch of the Pecatonica River. Nonetheless, it is a good approximation for this trip. We recommend either level, although we recognize that the disparity between them is huge. To offer some context, we’d say that below 6′ at Blanchardville is too low. On the other hand, 10′ is unusually high. Because we haven’t paddled this branch between 6′ and 10′, and because this is only a correlation gauge to begin with, we’re not comfortable speculating beyond this. But it stands to reason that ideally 7′ or even 8′ is a kind of Goldilocks level in between and would therefore be a good bet. Time: In at 5p. Out at 8:10p. Time: In at 1:15p. Out at 3:15. Wildlife: Great blue herons, cormorants, deer, wood ducks, beaver, muskrats, snapping turtle, morning doves and fish. This trip was a kind of “prequel” to the downstream segment of the Mineral Point Branch of the Pecatonica River we did last year. Shortly after we published that trip, a friend of the site tipped us off about a truly unique novelty further upstream of the section we padded: a 25′-tall dam with a nearly 45-degree angle slide that is perfectly safe to go down as there’s no backroller at the base. (A “backroller” is another term for reverse hydraulic, the formidable term that is dangerous (i.e., potentially lethal) to paddlers on account of its current trapping objects.) But here at the base of the dam it’s just a big ‘ole pool of flat water. Indeed, it’s a popular spot in summertime for kids (and kids at heart) sliding down in tubes, or just their butts. That got our attention. A quick glance at the topo map of the area got us intrigued, too, as it looked very promising for various rock outcrops and hills. Furthermore, we’ve driven over this body of water roughly a hundred times throughout the years, via Highway 151, each time inspiring a look-see down below and wondering what the paddling would be like through the valley. Paddlers have two options for beginning this trip: at the official boat launch at Ludden Lake, off of Ludden Lake Road via County Road QQ, which is half a mile upstream of the dam, or launching below the dam itself. To do the latter, you’d park at a small nondescript area on County QQ near a locked metal gate, before the road continues north and up a hill. You’ll be able to see the dam from here. It’s a 500′ schlep from the gate to the water, but there’s a discernible well-worn trail; the dam is popular for water park-esque kiddos as well as folks casting their lines. Ludden Lake itself is simply the effect of damming the stream, but it is a quaint cottage lake (more of a pond, actually) that is surrounded by hills and features a few exposed rock outcrops. There’s even a brief glimpse of Highway 151 which resembles a tall and huge rollercoaster from this vantage point. If you do run the dam, it’s wise to take a look-see first. Not because there’s a likelihood of obstacles or even to plan out the best route, but rather just to see what you’re getting into. There’s nowhere like this that we at least have seen. Also, if there are folks fishing, be sure to inform them of your intentions before bobsledding down the dam. Be prepared to need to nudge your way over the upper lip of the dam, as there’s hardly enough water there to comfortably float over and down. We don’t know if that’s a good thing by approaching the decent incrementally, or if it just adds more anxiety to the experience. Either way, you’ll have to scoot forward enough until your boat is more or less a fulcrum relative the lip of the dam, teetering in space as it were. At this point you’re committed. All that’s needed here is one final oomph forward, and before you know it you’re cruising down the wall faster than you’ve ever been in your kayak. And then you hit the pool below – woosh! All bets are off there, as it would be virtually impossible to predict how or where your boat will actually meet the water. We strongly recommend wearing a spray skirt. Not only will it keep your lower half dry, but it’ll keep water out of your cockpit – a lot of water! In our party, everyone who ran the dam (six of us total) landed just fine at the bottom. But those not wearing skirts took in a tremendous amount of water, often with the result of slowly but surely sinking before the paddler could reach dry land. It was quite comical, and good, clean fun. Also, don’t do this alone – make sure there’s someone else who can help you out, if things go south! And don’t do this in a tippy boat with a v-shaped hull. Here, the flatter the boat’s bottom, the better. Now, before the onslaught of angry letters comes in to the Miles Paddled mail department – some of which already assailed us when we simply posted photos of us going down the dam – allow us to anticipate a thing or two. Are we recommending that you do this? No. Showing that something can be done is in no way a tacit endorsement or implicit suggestion that it should be done. Is it inherently unsafe? In theory, yes – but so too is paddling at all, anywhere, always. Does running this dam mean that others also can/should be run? Absolutely not. Only if you are mentally comfortable with it and physically prepared – that means having the right gear (including safety equipment) as well as another person on dry land in case there is an accident – only then should you be even thinking about this. Should you wear a helmet? Sure, why not? Feel free to throw in elbow pads, too. Or simply don’t do this at all. It is absolutely a thrilling adrenaline rush, but it’s over and done with only a second or two after it begins. So, there’s the upshot of it all. Let us just state this one last time and then move on: Kids slide down the dam on their butts or on inflatable tubes on a regular basis. YouTube it, if you’re curious. If it’s safe enough for a 9-year-old wearing My Little Pony floaties… well, enough said. There really is no access at the County QQ bridge; the banks are steep, weedy, and muddy, and there’s no parking either. Below the bridge – the only one on this trip until the midway point at N. Oak Park Road – a short straightaway takes you head-on to a massive logjam pileup. Unless this has been flushed out from the historic high-water events in the late summer of 2018, which would be a blessing, you may well anticipate this obstruction being a nasty, ugly pain in the tuckus. It straddled both banks, making portaging around it a non-option. And it was too tall to just full-on ramming speed try to ride over it. Instead, we had to climb on top of and over it, which is always a little unnerving: at any point you could slip (it’s wet wood!) or have whatever you’re standing on give way, etc., all while pulling your boat and gear over and above, in humble hope of being able to get back inside your boat safely on the other side of the pile. Fortunately, for our trip this was the last obstruction – a doozie, you bet, but well worth the price of admission for the beauty that comes afterward. A meandering around 6’-tall banks takes you to a rock outcrop crowned with pines on the left., about 30′ tall, with textured, wrinkly fissures of colorful sandstone as though an elephant were squeezed into a huge ball. This in turn is followed by a second similar outcrop now on the right, equally aesthetic. It’s like a small model blueprint of the Wisconsin Dells. This pattern will continue a couple more times for the next mile and change. The current is quite gentle, so – to continue the amusement park metaphor – the whole effect feels like a tame trolley ride or “It’s a Small World (After All).” Sometimes the banks will be low, allowing for panoramic vistas of the valley and pockets of rock outcrops. Other times the banks will be tall enough to flank you intimately, with occasional swallow nests pockmarked in the mud. All in all, this section is one of the most pleasant and placid we’ve encountered in southwestern Wisconsin. Eventually, the rock outcrops will dissipate, the surround-sound of the landscape taking on a moor feel to it with open hilly plains, also quite lovely. The river really gets its meandering freak on here, so don’t expect to relax much or coast. But the current remains tepid at best. An isolated but striking outcrop exposed in a knoll like some kind of gorgeous tattoo revealed after rolling up one’s sleeve will be found on the right shortly before the susurration of rushing water. It’s not a set of rapids, alas – well, not technically. It’s a farmer’s ford that, unless the river is quite high (which will be quite unlikely, as it’s often too low to run in the first place) you’ll need to portage around on the left. It’s a simple portage. The ford’s poured concrete design with a series of small culverts creates these mini whirpools that ebb and flow, resulting in that charming gulch!percussive pitch more commonly associated with rock walls and huge bodies of water, be they Great Lakes or oceans: water going in, slapping about, then going back out. Kind of cool. From the ford to the midway point at N. Oak Park Road is approximately three-quarters of a mile. It’s a serene stretch of occasional riffles and rock outcrops punctuating an otherwise lush-green but unadorned rolling landscape of soft hills and sparse trees. A brief gurgle or riffles precedes the bridge at N. Oak Park Road, where we ended our first trip. Why? Because we only started at 5 pm, and a 5.4-mile trip of totally unknown paddling seemed far more prudent than a 9.6-mile trip (contrary to belief and occasional precedents, I don’t actually want my girlfriend to resent me). Taking-out here is not the easiest or most convenient place, but it’s certainly not the worst either. Do so on the upstream side of the bridge, on river-left. The bank here is low and it’s all big rocks, so getting out is pretty straightforward and mud-free. The gradient is a little steep, but car parking is located right there at the bridge, so there’s essentially no schlepping. There’s a metal fence lining a nearby farm as well as a small concrete retaining wall you’d have to hoist boat and body over to get to the road. Again, this is only if you were to take out here. There’s another farmer’s ford a quarter-mile downstream from N. Oak Park Road. On our addendum trip the water was so high that you could just paddle over the concrete land bridge, with the neat effect of running a Class I+ ledge with a drop of 18″ or so. Or you could just portage around it on the right. In normal water conditions this is what you’d have to do. The banks here are scrubby and brushy dogwood stuff. But after a mile or so you’ll pass by a gentle wooded hill on the left with an attractive but modest rock outcrop. There are riffles here, too, which add to the pleasantness. A zig here and zag there leads you to another similar rock outcrop also on the left. That’s generally it for the geology show, but the river environs remain pretty and engaging for the duration of this second half. Alas, you will be seeing a whole lotta corn. Soon, the Sudan Branch of the octopus-like Pecatonica River system comes in on the right. As wide as the Mineral Point Branch, it’s all but impossible to miss. The view behind it is awfully lovely: a long tall ridge in the backdrop very much like the nearby Platte River. See more about the Sudan Branch below in “What We Liked.” A few more meanders past corn country leads you to a handsome iron truss bridge atop stately sandstone block pylons that looks like it might have been a former railroad bridge but today is a farm bridge. On the downstream side of this the twin bridges of Highway 151 come into view, an effect that frankly was pretty underwhelming (admittedly, it was a sentimental interest to paddle beneath the highway). Of much greater interest, however, is a short run of totally unexpected Class I rapids some 600′ downstream from Highway 151. We scouted these to verify whether there were any wires strung across the river. There weren’t at the time of our trip, but we still strongly recommend scouting before running this, just in case. Lush, soft hills still frame the backdrop, although the river here is basically a water corridor running through corn fields. Another riffle or two greets the paddler during a series of meanderings, as well as a handful of rocks embedded on the right bank more like freckles on someone’s skin than traditional outcrops. In the final half-mile the river makes several horseshoe-shaped bends, all to the northeast. After the last of these, where a tall ridge of tree-lined pasture lies directly before you, the river will bend to the right and then lead to the bridge at S. Oak Park Road straight as an arrow. We took out on the upstream side of the bridge this time around, but again on the right. There’s better parking on this side of the road (technically north), and the banks here were low and grassy. We won’t step on the third rail of paddling that is running dams or spillways, but instead focus on what we liked downstream from Ludden Lake. We’re suckers for new streams (well, new to us), and if ever there were a trip that embodies the whole “explore the obscure” mantra, it’s this one. It’s fun to find diamonds in the rough, after all the low-hanging fruit’s been plucked. The light rapids, rock outcrops, and narrow width of the river in between the dam and the first bridge at County QQ are all wonderful. Totaled, they just have a really fun, engaging intimacy, at times jungle-thick. At other times they have the look and feel of a very old Driftless landscape. The prettiest rock outcrops are found after the logjam cluster downstream from County QQ. One after another, paddling beside these elephantine behemoths in calm quietwater was just a giddy treat befitting the whole theme park motif mentioned already for this trip. And when not rock-studded, the rolling lush green hills and pastures provide a supreme, palpable sense of serenity. The unexpected rapids below the Highway 151 bridge were fun and welcome, although we don’t know how runnable that brief stretch would be at lower water levels. All in all, there’s tremendous diversity in these 9.5 miles of creek-like paddling. As we say sometimes, every river tells a story, and this one features adventure, adrenaline, obstacles, stunning aesthetics, as well as the humble contemplation that comes with quiet calm. It’s a pretty damn good story! Sudanese paddling, anyone? After we wrapped up exploring the second half of this trip we were eagerly curious about the other stream we passed along the way. As already mentioned, it’s the Sudan Branch of the Pecatonica River. Having enough time and ample inclination, we drove to every reasonable bridge crossing over the Sudan Branch to get a twofold sense of how paddleable the stream itself is and how accessible it is via the road. It’s almost always the case that streams look more open and promising from a bridge than just up- or downstream from that bridge. Why? To taunt us paddlers like sirens singing to sailors of yore. Or maybe because there’s usually no trees near a bridge or tight bends at the banks. (Where there are trees along the banks, they’re likely to fall in the river. And where there are tight bends in a river environment, obstructions tend to pile up there.) Either way, even though we fall for this all the time, knowing that the view from a bridge is always misleading, nonetheless we’re infinitely full of hope. Hope vs. dopes. While driving around and trying to follow the feint blue line of the stream on the atlas gazetteer, we noticed a road called “Cave” that crossed over the water. Sure, it could’ve very well been named after some farmer whose surname was/is Cave, but given the territory – Driftless Area – it stood to reason that there might be an actual cave round these parts. So we checked out the bridge at Cave Road. There, it’s about as pretty and promising as an obscure creek could be. Indeed, we had a hunch and walked along the banks on the downstream side of the bridge some 20 yards or so and, whamo! saw what sure as heck looked like a cave. Technically, it’s more of a rock overhang than a true spelunk-junket of a cave, but still – a cave, for crying out loud! So, of course we paddled it, even though we had no idea what we’d encounter or even how long a distance it would be from the bridge at Cave Road down to the next one, where we’d left a car, at County Road E. What’s funny in retrospect is that the stream at Cave Road is not, in fact, the Sudan Branch, but rather something else entirely, called “Laxey Creek.” Shortly downstream from the cave, the Sudan Branch comes in. Which is a tributary of which, we have no idea. But, for those following along at home – and stay with me here – this was a branch of a branch of a branch of the Pecatonica River, a mighty tree indeed. The strainers in the first mile can be a little challenging and taxing, especially given the peppy current. Constantly dodging and ducking took away from the simple pleasure of paddling this section. The cluster downstream from County Road QQ, well, that’s another matter. Given the extraordinary high-water/flood events in the summer and autumn of 2018, it’s possible that this mother of logjams got clobbered and broken up, but we have no idea if that’s actually the case. Assuming it’s still there, it would have to be cleaned up with a grappling hook, accessible only on the private land, all of which is eminently unlikely to ever happen. So, paddlers will just have to deal with this, which is unfortunate but worth all the boons that come with this trip. The fords are not exactly welcome, but they’re simple portages all the same. Most paddlers will not have as much wanderlust as we, and so the second half of this trip will probably feel monotonous and dull. It’s certainly not as attractive or engaging. And just to reiterate, this trip will usually be too shallow to paddle without scraping or taking your boat for a walk. Dividing this trip in two halves at N. Oak Park Road as a put-in/take-out is, of course, an arbitrary marker that we used for ease of exploration and the time we had to do so. That said, the two halves really aren’t equals – the first half is unquestionably prettier. We’d paddle the Ludden Lake to N. Oak Park Road segment anytime there’s enough water. Next time around we’ll invest a little sweat equity cleaning up some of the persnickety strainers and tree debris in between the dam and County Road QQ. This section is too pretty and engaging to be compromised with tree debris. Also, if there were enough water to do this, we’d want to check out the segment upstream of Ludden Lake. It’s approximately 4-5 miles of narrow, squirrely meandering, so deadfall would be probable. But so too are rock outcrops and pleasant hills. Plus the experience of paddling a narrow, intimate creek into a pond-like lake would be a fun novelty. 7 miles. Hilly, but essentially safe for bicycling. Easy put-in at the Ludden Lake boat ramp. Now THAT’S a horizon line! Frisky riffles below the dam. A fun ride weaving through boulders & light rapids. Some ugly tree debris up- and downstream of the County QQ bridge. There’s no real access at the County QQ bridge. The gorgeous geology show begins after the logjam cluster. The rock outcrops come one after another like an amusement park ride. A pretty stretch no matter how you look at it. Grassy reclamation along the eroded banks. Sandstone outcrops hidden in plain sight all this time. Side channel under the watchful gaze of the sentinel. Striking colors on this rock outcrop. Suddenly a ford to portage. Approaching the Put-In/Take-Out at North Oak Park Road. Notably scrubbier downstream from the bridge. And this is what a ford looks like during high water. Two-tiered ledges at the ford. Fun to run at a rare high level. Riffly spot past more rock outcrops. Not as pretty as upstream, but still pretty pretty. Unexpected Class I rapids downstream from the highway. Totally pastoral below Highway 151. 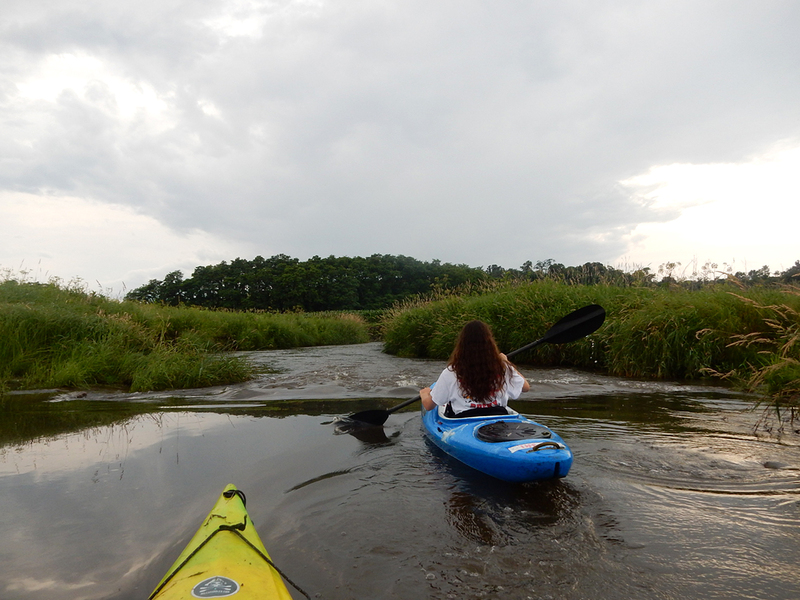 One last little riffle – with color-coordinated kayaker. At the top of the ridge is aptly named Oak Park Road. Decent access at South Oak Park Road, upstream on right. Image from neighboring Laxey Creek, on the hunt for caves. I spy a cave – Time for a look-see.